We are a couple hundred meters down from the high point of the chapada in a deep valley where the rivers meet; a place where the water will never run out. 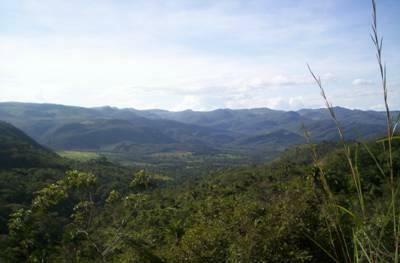 My older readers know of my project in the interior highlands of Brazil. This picture is the view from the top of the valley and as you can see overpopulation is not a problem here. It was in 1991 that I parachuted into this beautiful region, what’s called the high chapada about 200 kilometers north of Brasilia the federal capital. My heart has made a good home in this beautiful country though presently I live far away on the northeast coast in a modern city. Brazil, in my and some other peoples’ opinion is probably positioned to have the highest quality of life in the 21st century. It is a vast country with tremendous water resources and an extremely low population density in most areas outside the huge cities like Rio and San Paulo. There is only two nuclear plants, no coal fired electrical plants emitting friendly CO2 and highly poisonous mercury, plenty of good food and friendly people. We have our problems here but insane economics is not one of them. Brazil has prudently been paying down its international debt for years and is now considered a creditor country with enough money to spare to pay off all its debts if the leaders thought that was a prudent thing to do with the country’s cash. I have for the last year and a half left the project in hibernation but am now ready to take it out of mothballs. We had run out of money and I was too busy writing and publishing my series of medical books and my one book on the heart, love and the vulnerability of being that I wrote many years ago on the chapada. It was the reason I believe I was sent here. To write a book (HeartHealth) on love and the nature of the human heart because this is a land that still has heart and soul, at least when it comes to music and football (soccer). Brazil doesn’t have a government that goes off around the world killing as many people as they want though my son believes that people are not that different meaning if the Brazilian government had the power the Americans did they would be setting sail for misadventures around the world too. Sorry the Garden of Eden can only be found right now in ones own heart and perhaps with a life partner or a small group consciousness. The structure and project was originally to be a very exclusive retreat center for healing and the surrounding region is loaded with practitioners of every stripe and more than several of my neighbors in the valley are doctors from Brasilia who have their second homes here. I cried profoundly the day I knew I was going to get this precious piece of land that is surrounded on three sides by two rivers one of which you can drink directly from 365 days a year. Just in terms of its water resources it’s a water mine and a water park. 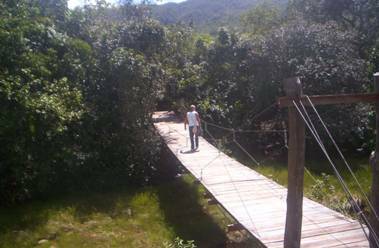 This is me walking across the bridge we built that got washed away last year in the rainy season. The tiny little town of about perhaps a 100 houses is the setting on one side of the river and we are on the other. Right now one has to walk across the stones that are set in the river but that’s impossible when it rains. Part of the project integrates with the town’s people who are simple good folk and some are actually decedents of the slaves that were once in the area. There are plenty of hippies and end of the world people from Europe and other parts of Brazil there as well. You can imagine my sadness at even thinking about selling the place but alone I have run into a dead end in terms of financial resources this past year and a half having invested totally in publishing a series of books, second editions and a whole series of web sites. We have a whole network of affiliates who are supporting our work and we are open to forming partnerships with others to bring IMVA publications into other languages and countries. Already we have IMVAR coming on line in Russia and are trying to do the same in the Far East. So I am asking for support and even donations to help finish the project and again would even entertain a partner or two. Yesterday I even talked to a woman in Uruguay who owns a land/park with three waterfalls less than a mile upriver and she is open to joining our projects in some way. Certainly I am open to creative input and someone showing up with new energy for our project, though we already have a strong soul imprint. I put this out just as I publish Into The Ashes, Climate Change and Agriculture News sites suggesting world calamity is just around the corner for humanity and I want my communications and invitations pertaining to our Sanctuary project to be received in this light. This is an extremely serious moment with a huge part of the world’s population now vulnerable to catastrophe though would you believe, in the city I live, you would never ever think there were problems in the world. I have published an essay called It Matters Where You Live and it was in great part about mercury pollution, something most people just do not want to talk about. 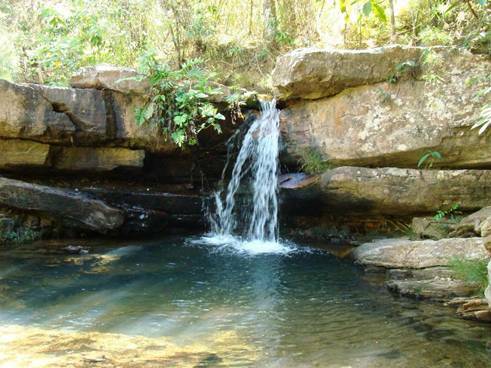 It would take a lifetime to explore all the sweet spots in the region and really it’s impossible to count all the waterfalls on the high chapada. Yes some people have all the luck and can live in places like this though it is my belief that we are all going to struggle with what is coming. When I came to Brazil 18 years ago it was with a prayer answered and when I heard the message (in plain English) I felt Goosebumps and did not doubt for a moment the import of those feelings. I found a home distant from the insanities in medicine and here the government is even friendly to medical alternatives to the point of endorsing the use of herbal therapy, acupuncture and homeopathy in public clinics. When I shared about our shrine dedicated to Mother Mary with this woman yesterday who owns the land upstream she also felt these Goosebumps. It is my belief that one can set ones sails from such feelings. 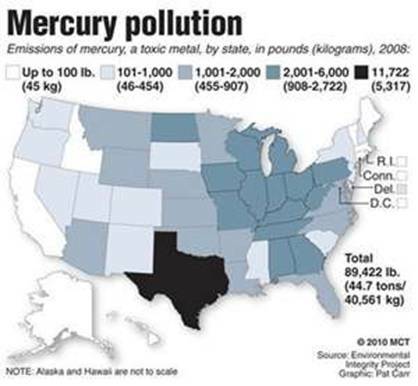 In Texas the mercury pollution is so intense it was possible for researchers to measure autism prevalence by education district finding of course that areas with the highest mercury emissions had the highest autism rates. I would have thought things like this would have driven out hordes of people but that is not the nature of people in the first world. Now there are many reasons to try to escape with fewer and fewer that have the resources and courage to do so. For me and my family Sanctuary is a survival retreat center and we intend to keep living on the coast for as long as possible. I don’t have plans of living in the interior unless the world goes up in smoke, which it might as the clouds continue to darken between Israel, Iran and the United States. I fear the worst in terms of that. Don’t underestimate the need for intense full out war as governments just cannot stand seeing their economies collapse without some external diversion. It is not my destiny right now to be exploring all the beauty there is to see on the High Chapada though I cannot complain with the ocean and beaches so near by. I have the responsibility to broadcast to the world the news of what is happening in medicine, agriculture, climate, economics and finance. Luckily I have a builder partner on site that I can trust with my checkbook and my life and his brother is the one who this woman from Uruguay trusts. So forgive me but understand if I do not respond to casual inquires. It is not really a time for playing around though it is still time for love and not taking oneself and what’s happening in the world too seriously. For me that was my mentor Christopher Hill’s most interesting teaching, thou shall not take thyself too seriously. It was his eleventh commandment. When I was young I took myself much too seriously and suffered with the terrible disease of self-obsession and self-pity. Luckily through two decades of meditation and devotion to love I found my way out of that nightmare. If you resonate deeply with what I have written today and my other work and want to get directly involved with me and this project and have a big YES screaming in your head and heart please let me know. Goosebumps only please! In terms of Sanctuary and getting involved with us please inquire only if you have the strongest feelings about participating and have the resources to do so. Donations of course will be accepted from anyone wanting to support the IMVA home base that will do everything it can to be a light in the darkening world. It is five years since I wrote an essay called The Dark Ages of Medicine; and even though I wrote years before of everything from the terrorism of the military to the terrorism of money and debt I did not feel the coming dark ages of man as I do now. So to build a fortress of Light I obviously need a lot of help. Special Note: Brazil has already emerged from the worst of the recession. Posting new stock market highs, decreasing unemployment and strong GDP figures which along with all time low lending rates and a pro-active government, Brazil is currently one of the strongest economic powers in the world. This summer Brazil lent $10 billion to the IMF, which is amazing, given that only a few years ago they were borrowing from the IMF. Brazil also holds historically high USD deposits (not a very good idea), an abundance of newly discovered oil and an export industry that is going from strength to strength though in the future there is no security as the first world tanks.